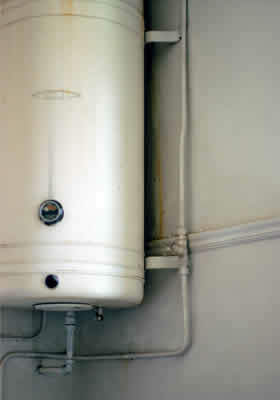 When a water heater starts leaking, getting it repaired by a qualified plumbing expert as soon as possible is a smart move that can save you a lot of money in the long term. That's because to ignore something like that can lead to more serious moisture damage to your home that gets worse the longer it goes on for! It's surprisingly common to find that floorboards and even joists have rotted right through over a long period of time because of the constant and cumulative damaging drip of a leaky boiler. That's when the big expense hits you hard because it can end up costing you thousands of dollars to repair extensive water damage to your home compared to a couple hundred it may have cost you to call out a plumber in the first instance. Either of these can be determined just by looking and it's something you can probably do yourself. If the leak is some place else that is not so obvious, you will need to get the professional help of a local licensed plumber to diagnose and fix the problem. To find the T & P valve, look on the top of the heater tank and you'll find this device that is meant as a safety measure to prevent excessive pressure or temperature levels inside the tank. If the leak is emanating from there, it often means either a defective valve or there is simply too much pressure or the temperature is too high in the tank. One simple job you can do is to check the temperature of the water if there is a reading or set the thermostat to the medium setting. Sometimes, simply turning it down relieves the stress on the valve and if it's working normally, the leak may stop. If it doesn't stop, then you may have a mineral deposit build up which will need to be cleaned by removing the valve. If you're confident about tinkering with things like this, then you can do it yourself after turning the power off and letting the tank cool down. If not, you should call a plumber to do it for you. The drain valve looks like a small faucet and is located near the base of the tank. It purpose is for flushing the tank to remove mineral build-up, which is something you're supposed to do at regular intervals but most people don't bother. Screw on to the threaded end of the tap a brass garden hose end cap. That will stop it leaking for now, but bear in mind you should not expect this to be a long term repair, for which you should get a professional to do the job properly.